Size is 12' x 18"
The SR-71 Blackbird is one of the most iconic airplanes of the 20th century. Build by Lockheed in the early 1960s the mysterious reconnaissance aircraft flew higher and faster than any manned aircraft before or since. 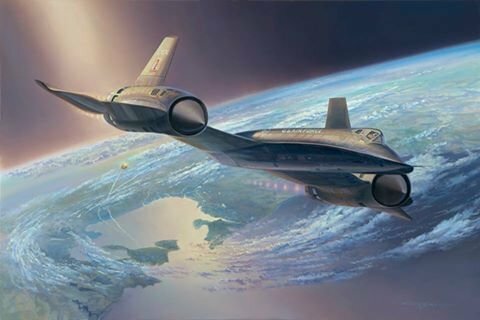 During the Cold War Blackbirds flew missions on a regular basis against Soviet targets and had over 1,000 missiles launched against it over the career of Blackbird operations. In this painting the landscape below is the Russian Naval base at Petropavlovsk on the Kamchatka peninsula. This area was a regular target for SR-71’s based at Kadena air base on Okinawa. Along with ballistic missile submarines, a major MiG base and ground base ballistic missile test sites were located in this area and made for a treasure trove of photographic and ELINT intelligence gathered on Blackbird missions.